It's here! It's the first day in the series "31 Days to Your Domestic Monastery!" Today is the feast of St. Therese of Lisieux, commonly known as "the Little Flower," and I can't think of a more fitting feastday to begin this journey. St. Therese lived in France at the end of the 19th century. She lived a quiet, hidden life, joining a cloistered convent at the age of 15. "So what can she possibly have in common with my life?" you may ask. Therese wrote her autobiography, The Story of a Soul, before she died, and in it she detailed her lifestory and the ways in which God was at work. From this beautiful book, the world came to know about the "Little Way." Therese knew that she was little and insignificant. She knew that there was only so much she could do for God. 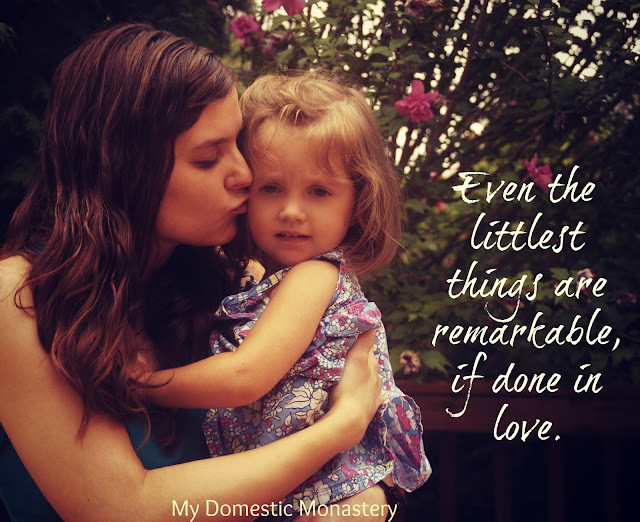 And so, Therese taught that rather than doing great things, we should do small things with great love. She believed in offering up every little thing we do, in love, to God. In fact, it was this teaching of Therese's that was such an inspiration to Mother Teresa. The Little Way is the model for holiness in family life. Family life is chock full of little, tiny, seemingly insignificant things. Changing a diaper, wiping a messy face, making beds, folding laundry - there is nothing remarkable about family life. Except, that is the thing - it all is remarkable, if it is done in love. The family is the first place where we learn to love. It is the little school of love. At the same time, it is sometimes hardest to love those who you live with. It requires a conscious choice to keep loving, even when you're tired or annoyed. Love is a choice! And yet, I'm willing to bet that you are naturally already making that choice on a daily basis. If you're anything like me, you aren't making that choice perfectly, but you're simply trying to love in whatever little ways you can. Your first reaction to your child's cry is to comfort them. When the laundry is dirty, you clean it. When bellies are empty, you fill them. It's just what we do, as parents. Likewise, if you aren't a parent yet, you know that this is often what we do to anyone we love (especially our spouses). We want what's best for those we love, and we're usually willing to make sacrifices in order to achieve that end. Today's challenge is simple - make yourself aware of the little opportunities for love. Every day is full of little opportunities to love. I'm sure you already take advantage of some of them, but there is always room for growth. Observe the ways that you already choose to show love in the little moments, and observe the times that you could better show love to those you encounter. Are you getting unduly frustrated about things? Are you yelling at your children or spouse or friends? What is one little step that you can take to respond in a calmer, more loving manner? This is the first and most important step in growing a domestic monastery - choosing to love. Love doesn't necessarily come naturally. But a home that chooses love - even if they don't yet choose it all of the time...even if they only choose it 25% of the time in the beginning - is a home where the members can feel safe and secure. Cultivating a loving and safe environment lays the foundation for everything else. Dear God, thank you for St. Therese and her Little Way of Love. Help me to grow in awareness of the ways that I can become more loving. Help me to do each thing that I do from a place of love for those around me. Amen. Beautiful! Such a good reminder! !